Our ancestors – the ancient Slavs, Easter was celebrated the arrival of spring and the blossoming of nature. The girls drew and painted eggs. As you can see this ancient pagan tradition preserved to our time. 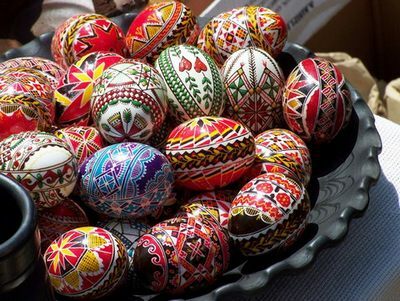 Sami Easter eggs symbolize the rebirth of life, at the end of Easter eggs, these fed cattle (the fruits of good). Also, young people in the day did circle dances, sang songs about love (it was like a magic ritual that should appeal to the welfare and prosperity), and rode on a swing. The higher the swing flew up, the greater should grow ears of corn and grass. The ancient Scandinavians and Germans at that day drew Eggs, and gave them to each other. In them, this day was dedicated to the goddess of spring, Ostara. The English word “Easter” is likely derived from the name of this goddess. The peoples of the Mediterranean holiday Easter was celebrated after the vernal equinox, from 22 to 25 March. (Probably due to more southern geographical position they have all bloomed a bit faster than that of the Slavs and the Germans, Scandinavians). It was during this period accounted for the resurrection of the god Atys. Atys – the husband of Cybele – the Thracian goddess of fertility. He was the god of rebirth of plant life, according to legend – born from a virgin, died each year, and again rose from the dead on Easter. At the dawn of Christianity had happened, the first Christians and the pagan followers of the cult of Cybele and Atys were strongly debated who really rose from the dead: Atis or Christ. The Jews – one of the first people who began to believe in one God, the feast of Easter (Pesach) was associated with the release of the Jewish people from Egypt. In memory of these events at the Temple had to sacrifice a lamb. Jesus and his disciples came to Jerusalem just in time for the celebration of Pesach. Triumphantly rode into Jerusalem riding on a donkey, then made a rout in the Jerusalem temple, and then was betrayed by one of his disciples – Judas, was arrested, issued to the court for the Roman procurator of Judea Pontius Pilate. Finally, Pilate sentenced to death on the cross, being crucified on “Good Friday” He was resurrected on the third day – Sunday. To his disciples, the apostles – the early Christians, this event was a great miracle. From now on Easter Christians celebrate the great mystery – Christ’s resurrection, his victory over death and spiritual rebirth. Revival after hibernation Mother Nature magically united with rebirth, resurrection of the Son of God – Jesus Christ. Christian Easter celebration has become one of the greatest of Christian mysteries. There is still a tradition of theatrical play of the biblical events, when the young guys in the form of the Roman legionaries night stand guard in front of the cave, which supposedly buried the body of Jesus. In the morning the coffin of the Lord endure out and open, but it is empty. So begins a great day – Easter, people greet each other with “Christ is risen!” And “Truly He is risen.” Well, more like those already celebrating, I wish you all a delicious Easter and festive mood.